One of the charms of historic newspapers is their habit of publishing updates for stories that they never actually reported on in the first place. It's as if the editors assumed—probably rightly so—that their readers were instantly aware of those initial incidents by the more efficient means of the small-town grapevine. Little Stanley Hart is now in a fair way to recover. It would now seem that the wheel could not have passed over his head, although his head was badly crushed. No one saw the accident occur, as he was trying to climb upon the load without the driver's knowledge. He has had a hard and painful experience and the family an anxious and trying time. Stanley Beaumont Hart was just nine years old at the time this alarming report was published. He was the son of Auburn attorney James Hart and his wife Eliza. Stanley lived with his parents, his grandmother Louisa, and his younger sister Rose in a home called Summerfield just north of Auburn (in an area then called "Christopher"). Based on this brief newspaper article, we can reasonably assume he was a typical nine-year-old boy, full of merriment and mischief. James Hart, in addition to being a prominent attorney, was also an experienced architect who frequently employed his skills for the good of the growing Auburn community. 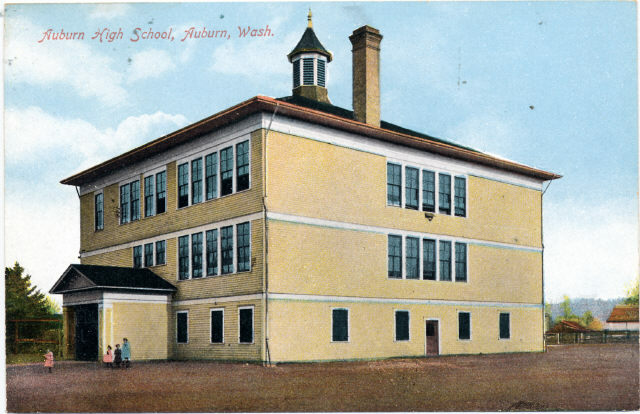 James, in fact, designed Auburn's very first high school as Washington made the shift to a twelve grade standard education (rather than the previous eight grade standard). It must have been a point of pride for James to know that his son Stanley would be among the first students to graduate from the new school in 1906. Stanley was one of just three students in that very first graduating class. Unfortunately, fate caught up with young Stanley Hart before he had a chance to collect his diploma. In March of that year, Stanley came down with a fever which was eventually diagnosed as typhoid. Stanley passed away just weeks before he would have gone through commencement exercises with his two classmates. His family, as well as the community at large, was understandably devastated by his loss. The Harts buried Stanley in the Auburn Pioneer Cemetery alongside his grandmother Louisa, who had died just a year earlier. James and Eliza then donated a portrait of Stanley to the Auburn High School to show their appreciation for Stanley's school and teachers. Did the rigors of academic requirements play any role in Stanley's death? All we know at this date is that Stanley appeared to have struggled during his school years. By the time he was preparing to graduate, Stanley was already past his twentieth birthday. Certainly the family he left behind was devastated by his death, especially Rose, who suffered greatly from the loss of the brother who had meant so much to her. 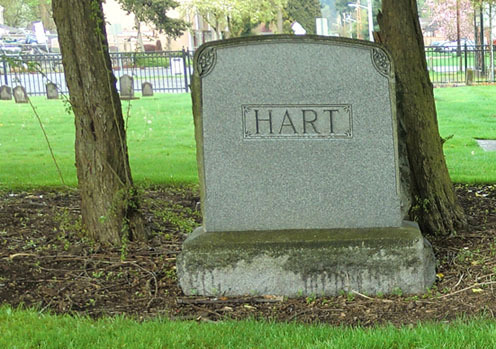 Hart Family Monument in the Auburn Pioneer Cemetery, 2013. * Stanley was in fact the only son of James Hart and is second wife Eliza. It is unclear if Rose knew that James had two other sons from a previous marriage. Her half-brothers remained behind in England when James Hart immigrated to America with his parents.